Automatic Transmission, Air Cooled, Front/Rear Disc Brakes, Aluminum Rims, Tow Hitch included, Metallic Paint. This model is not for sale in CA. The Mojo Magic PST50-1 is a ton of fun and style on three wheels. Upgrades throughout give this scooter its magic, white piped seat, LED taillight, LED turn signals, and spoked custom rims. Automatic Transmission, Air Cooled, Front/Rear Disc Brakes, Aluminum Rims, Tow Hitch, and Metallic Paint. 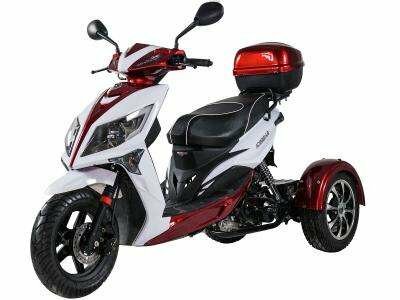 The 150cc Ice Bear Motor Trike also comes installed with a CVT automatic transmission which is operated by the simple to use ‘twist & go’ throttle acceleration. With this trike, the driver will have no worries about using a clutch or gear shifting to change speeds, because it is completely automatic and completely stress and worry free. This motor trike is EPA and DOT Approved and is registerable as a street legal vehicle in 49 states except for California. CARB approval is pending, therefore we cannot ship this trike to CA residence, thank you for your understanding. The 150cc ICE BEAR Motor Trike comes with shut off switch in case of any emergency. With one press of the button it automatically cuts the engine so you can stop easily. The 150cc Ice Bear Motor Trike for sale comes with hydraulic disc brakes on the front and rear! Hydraulic disc brakes are the best possible brakes to have because they provide the best stopping power. These brakes are high quality, reliable, and very safe. This gas motor trike is equipped with a 150cc 4-stroke engine that has an up to 50 MPH speed capability. This engine is very reliable and will outlast any other engine on the market. A vehicle’s wheels rotate at different speeds, especially when turning corners. The differential is designed to drive a pair of wheels with equal force, while allowing them to rotate at different speeds. Compares to those standard gas scooters, the 150cc ICE BEAR Motor Trike offers a safe and fun 3-wheel drive for the family. Durable and low maintenance than the belt driven system. Available in Yellow/White, Green/White, Blue/White, Burgundy/White, Black/White.